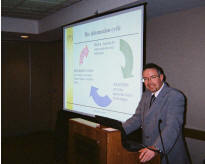 The PIUG Annual Conference, held May 21-26, 2005, in Arlington, Virginia, focused on “The Future of Patent Information – Tools and Techniques for Adding Value.” Conference speakers and forums covered subjects such as how effective management of intellectual property information can increase a company’s competitive edge; adding value to patent data and patent search reports; discerning competitive intelligence from patent information; and the paperless and other initiatives at the United States Patent & Trademark Office (USPTO). Speakers and attendees included employees of patent offices, research firms, pharmaceutical companies and law firms from around the world. Panel discussions covered a variety of topics and gave ample opportunities for questions, suggestions, and feedback between government agency representatives, patent researchers and vendors. The conference also highlighted issues regarding effective research techniques, analysis, and interpretation of both patent and non-patent intellectual property information. A complete list of meeting topics and speakers is provided below. The event also included a trade show for patent search service providers and vendors of value-added patent research, analysis, and management software tools. 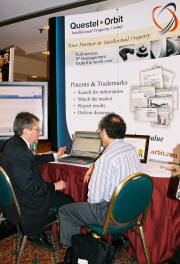 The tradeshow provided an opportunity for patent information research professionals to learn more about new tools being offered by vendors and for vendors to hear suggestions and feedback from their users. Sponsors and exhibitors had the opportunity to share reviews of their products and services in special segments off the tradeshow floor between speaker sessions. 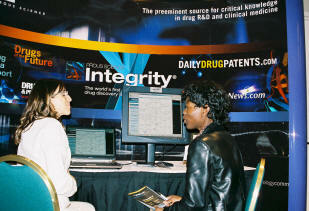 The product review segments were a new feature at this year’s conference. 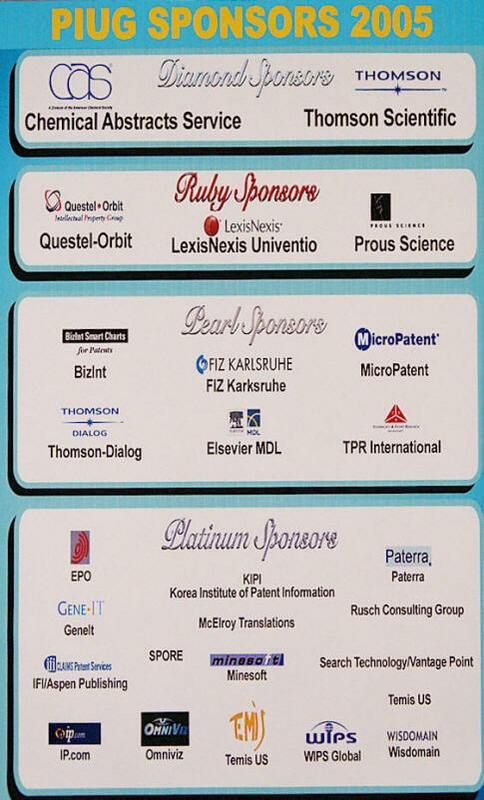 A complete list of sponsors and exhibitors is provided below. This year’s event included a tour of the USPTO’s new Alexandria-based Carlyle Campus, covering their state-of-the-art public search facility and electronic & print technical libraries. A networking cocktail hour and dinner, hosted by CAS (Chemical Abstracts Service), was held at The Chart House restaurant in the “Old Town” section of Alexandria, Virginia. A reception and dinner at the Ronald Regan Building & International Trade Center, hosted by Thomson Scientific, also included the presentation of the 2005 IPI (International Patent Information) Award. This year’s IPI Award winner is Ms. Edlyn Simmons of Proctor & Gamble. Ms. Simmons received the award for the work she has done to improve the quality of patent information in the field of chemistry. Please see www.ipi-award.com for more information on the IPI Award. “The Solid Gold Cadillac,” a play performed by the IFFI Players during an ice cream social provided a time to take patent information a little less seriously. The play’s theme featured a parody of events that took place at a hypothetical large information products and services company. In order to provide a balanced view of the inner and outer workings of a large corporation the IFFI Players included PIUG members from both the patent information user and provider communities. 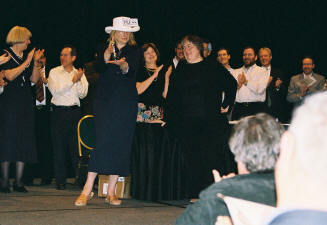 Incase you could not attend this year, DVD videos of the 2005 conference can be ordered from the PIUG online store website, www.shop.piug.org. Please look for changes to the PIUG’s online store website address in the near future. Keep up with the future of patent information and attend next year’s PIUG Annual Conference, to be held May 20-25, 2006, in Minneapolis, Minnesota. Author bio: Glen Kotapish is a patent research professional and founder of www.PlanetPatent.com. He is president of the Inventors Network of the Capital Area, www.dcinventors.org, and a member of NAPP, www.napp.org, and IPO, www.ipo.org. Speaker: Alan Porter, Georgia Tech/Search Technology, Inc.
Panel Discussion: Where are We Headed and How to Get There? Full Text – Spinning Gold Out of Straw! 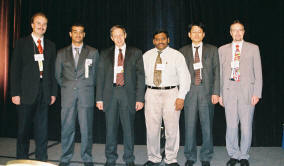 Speaker: Dr. Marudai Balasubramanian, Pfizer Inc.